3 ft. 7 ft. 10 ft. 14 ft. 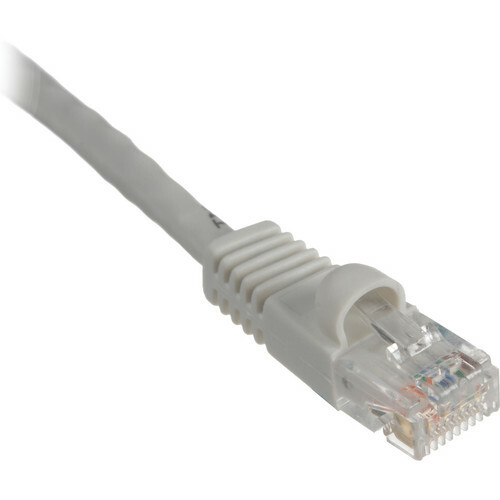 The 7' (2.1 m) Cat6 550MHz Snagless Patch Cable (White) from Comprehensive is an Ethernet patch cable, suitable for use in professional network installations. It features a male-to-male design, using standard gold-plated RJ-45 connectors on each end. The cable's 550MHz greatly reduces loss when compared to standard 1000MHz cable. It is suitable for use in Gigabit Ethernet networks. Box Dimensions (LxWxH) 6.0 x 6.0 x 0.5"
7' (2.1 m) Cat6 550MHz Snagless Patch Cable (White) is rated 5.0 out of 5 by 2. Rated 5 out of 5 by Lawrence from Easy cable identification Purchased as wanted colored cable. About same price as cat 5e.